"I thought it was important for her to come down and see this experience today," said one woman, who brought her 11-year-old daughter to the Capitol Rotunda Tuesday as the former president lay in state. 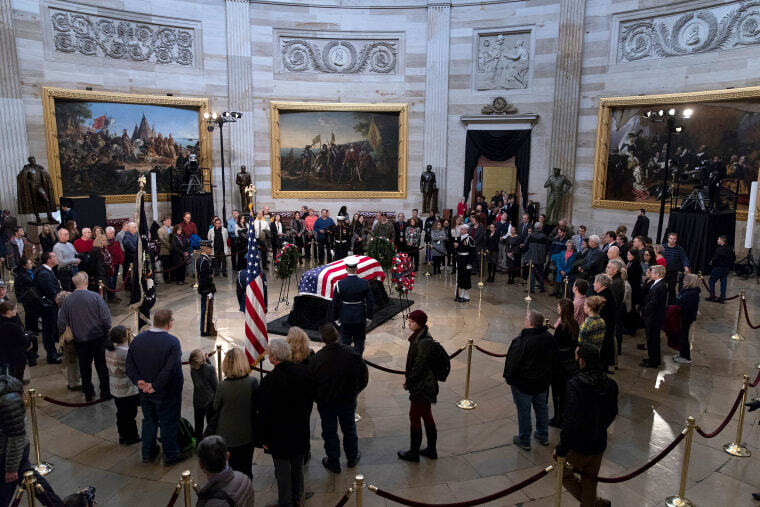 WASHINGTON — A massive influx of mourners flocked to the Capitol Rotunda on Tuesday to pay their respects to George H.W. Bush as the former president lay in state. Bush, who died Friday at 94, is only the 31st individual and 12th president to be so honored. Sen. John McCain, R-Ariz., and Rev. Billy Graham received the honor earlier this year, but a former president has not lain in state since Gerald Ford died in 2006. Many parents who lined up said they had felt it was important that they bring their children — who were born long after the 41st president left office — with them to pay their respects. "I think this was a really, truly a good man and he served our country for so many years, and I thought it was important for her to come down and see this experience today," said Sharon Gagner of Alexandria, Va., who brought her 11-year-old daughter Gretchen. Gagner, who described her family as "big Bush fans," said the former president reminded her of her grandfather, a "good, hardworking World War II vet who just gave to his country." "My father also felt a huge affinity for H.W.," Gagner said. "My father served in the military and he just really felt that this was a decent human being. Just a decent human being." For some veterans in attendance, Bush held a special significance as the last president to have served full-time in the military. "He was a very great man. It means a lot that I will have this opportunity to honor his memory," said retired Navy Commander Howard Smith. "I would do it any day of the week." Bush enlisted in the Navy on his 18th birthday, and as a military pilot was shot down over the Pacific during World War II. After his rescue, Bush returned to the skies, flying 58 combat missions throughout 1944, according to the Naval Heritage and History Command. "He was an inspiration," Smith said. Bush's military legacy resonated with other active duty members in attendance, including Air Force Colonel Thomas A. Summers of Lorton, Va.
"I appreciated the commander-in-chief's leadership and thought that he set a shining example for all Americans and patriots to aspire to," Summers said. For some students in attendance, the occasion was an unexpected learning opportunity. A group of eighth graders from St. Mary's School in Aliso Viejo, California had planned for months to tour the Capitol on Tuesday as part of their annual D.C. field study. Bush's death on Friday changed their agenda for the day. "I think for a lot of the students it made the experience — like, not just historical and awe — it’s emotional too," said Daniel Kearney, a St. Mary's history teacher who was chaperoning the trip. "They were talking about the rotunda in this way that they didn't talk about it last year," Kearney said. In previous years, students focused more on the art and architecture of the Capitol. This year they were "floored by the experience," he said. "We had enough students that we were basically surrounding the casket. They really felt the moment," he said. Funeral services will be held for the former president at Washington's National Cathedral Wednesday.